For the first time ever the world has seen over a Billion smartphones sold in a calendar year. According to latest Gartner report, close to 1.25 billion smartphones went off the shelves in 2014 on back of record fourth quarter. 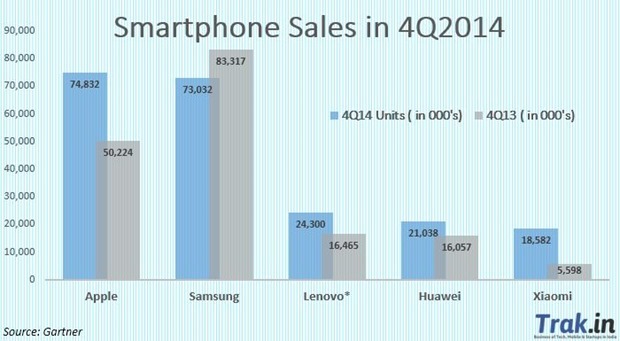 Smartphone sales witnessed 29.9 percent increase in 4Q2014 compared to 4Q2013. Over 367.5 million units were sold in fourth quarter globaly. In the calendar year 2014, sales of smartphones to end users totaled 1.244 billion units, up 28.4 percent from 2013 and represented two-thirds of global mobile phone sales. This is one of the worst quarters for Samsung as their market share eroded by whopping 10 percent in 4Q2014 alone. Samsung had held on to top spot for past 4 years! Lenovo (which acquired Motorola last year) was placed behind Apple and Samsung having 6.6 percent market share globaly. 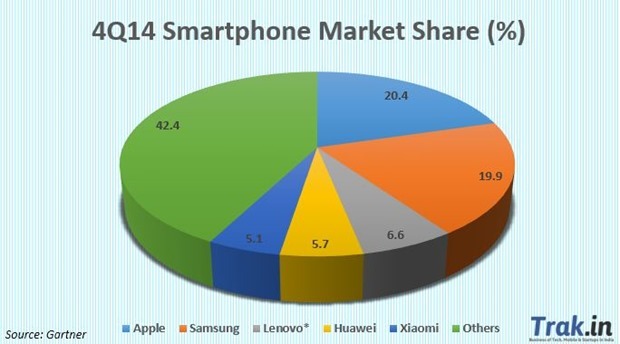 Huawei (5.7%) and Xiaomi (5.1%) were respectively ranked fourth and fifth smartphone vendors in the world. Samsung has been steadily losing market share over last year, but in fourth quarter the slide has been very significant. Samsung’s loss has been due to many factors that include rise of value for money smartphone offerings from Chinese vendors, launch of iPhone 6 and 6 plus from Apple and lack of demand for premium high-priced smartphones. As far as the market share goes, Xiaomi registered significant growth – their market share increased from 2 percent in 4Q2013 to 5.1 percent in 4Q2014, a rise of over 250%. On the other hand Samsung lost over 33% of the market share in single quarter – From 29.9% in 4Q2013 to 19.9% in 4Q2014. Apple reported its best quarter ever in the fourth quarter of 2014, which saw it sell 74.8 million units and move to the No. 1 position in the global smartphone market. Apple’s first ever large-screen phones continued to see huge demand with sales in China and U.S., growing at 56 percent and 88 percent, respectively. Android further increased it market share and now commands over 80.7 of global smartphone market. 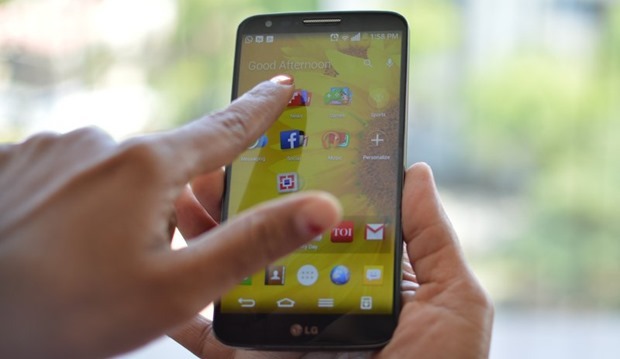 Over 1 Billion Android based Smartphones were sold in 2014. This also means that for every 1 iOS phone, 5 Android phones are sold. Although, iOS saw rise in the unit sales compared to 2013, their market share fell marginally from 15.5% to 15.4%. 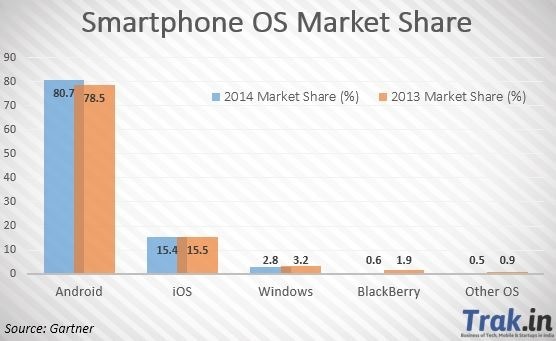 Windows, Blackberry and others, all saw fall in their market share compared to previous years! Micromax is now the 10th largest mobile phone vendor in the world according to Gartner!